How do I know if my mini pig has a broken bone? A fracture refers to a break or crack in a bone. There are several different types of fractures, and each type has different complications and methods of repair. Your veterinarian can help you decide how best to fix the fracture and if referral to a specialist is in your pig’s best interest. Although splinting will allow a small number of fractures to heal, most will require surgery to ensure the best outcome. Some species of animals always require surgery on foreleg fractures due to the high failure rate of splinting. Mini pigs can suffer fractures from simple things such as jumping off a sofa or bed, slipping on a slippery floor or while outside playing. 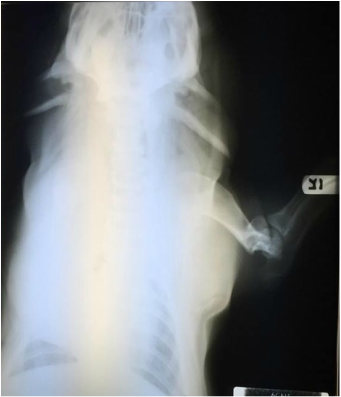 If you notice a change in your pigs disposition or notice a limp that wasn't there before, know of a recent event that may have resulted in a broken bone or see an obvious defect, such as a bone protrusion from the skin or something similar, your pig needs to be seen by a veterinarian. Open (formerly known as compound) fracture: fractures associated directly with open wounds (the bone may or may not be visible through the wound). Dislocation: an injury to the connective tissues holding a joint in position that results in displacement of a bone at the joint. Sprain: an injury to a joint, ligament, or tendon in the region of a joint. It involves partial tearing or stretching of these structures without dislocation or fracture. Other types of orthopedic injuries can involve torn ligaments, particularly in the knee. Many obese older pigs will tear the cranial cruciate ligament in their knee, which results in a sudden loss of use of the leg, and joint pain and swelling in the knee. Surgical stabilization is the best means to repair this injury. Before treatment, precautions should be taken to prevent biting injury to the first aid provider. Contain your pet. Stop bleeding with direct pressure. Open fractures should be covered with a sterile gauze dressing if possible. If this is not available, use a clean cloth or feminine pad applied over the opening and bone. 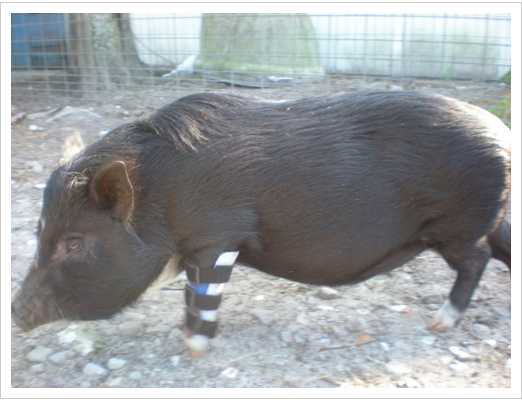 If the pig can still use three legs, support the rear legs with a towel under the abdomen (with the ends held together above the back) used as a sling. Splinting the fracture at home without pain medication greatly increases the risk of being bitten, and may actually make the fracture worse. Some fractures, such as thigh or femur fractures, cannot be splinted. The best advice is to keep the pig quiet and calm, protect yourself and head directly to a veterinary hospital. Do not flush the wound with saline or water as this only risks driving contaminants deeper into the wound. Never attempt to set or reduce a fracture or try to push a protruding bone back into position. Do not give any over-the-counter or prescription medications to your pet unless directed to do so by a veterinarian. A fracture, dislocation or severe sprain may be suspected when the animal suddenly appears lame on a leg, or picks up a leg and won't use it. These may also be suspected following any major fall or blunt injury. Obvious findings of a bone sticking out from (protruding) a wound are rare. What is more common is the unusual angle or deformation of the fractured area, and swelling. Accurate diagnosis requires the use of x-rays, which usually must be taken with sedation or anesthesia to get the most accurate results. An x-ray is the only way to accurately diagnose a fracture. Click here to learn more about causes of fractures. This is Daisy the pig. 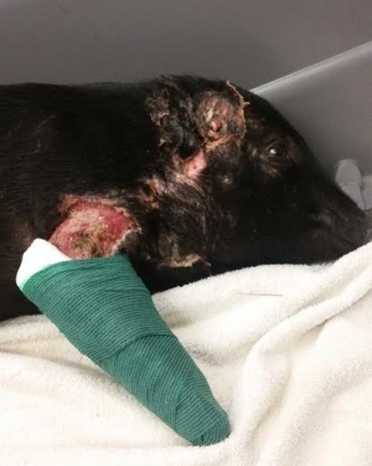 She had a broken leg because her brother, Duke, pushed her over. It was one of those, just the right push, at just the wrong moment. Nonetheless, this break required a plate to be screwed into the bone to stabilize the injury. Accidents happen. If your pig is limping or unable to put any weight on a leg, check the leg for obvious signs of injury, check the hooves for any signs of problems and then call your vet. It very well could be a broken bone that can be easily repaired.